Blackplast R is an asphalt solution. It has a very short drying time. It is intended for priming concrete substrates, cement, cement-gypsum and ceramic surfaces. 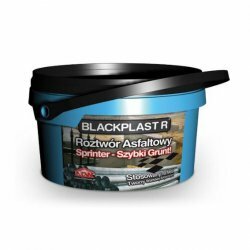 Blackplast R can be used as an asphalt varnish. Used on a metal surface, it forms a coating that protects the metal against corrosion. It has very good adhesion to concrete, metal and wood. It is used for impregnating elements made of wood and wood-based materials used outdoors, eg fences, balustrades, fence poles, roof shingles. It can be used to make independent "light" insulation coatings, eg concrete rings, well pipes, foundations of fences, etc. Wear protective clothing, gloves and goggles at work. Use in airy places, away from fire. Protect against children.